It is easy to appreciate when the flavor of a wine matches the aromas. As in a good Chablis, where the smoky aroma of flint and herbs, seamlessly are captured by a taste that is clean, hard, uncompromising and ... absolutely gorgeous. But Alsace offers a lot more surprises, where aromas and flavors may seem to come from different worlds. 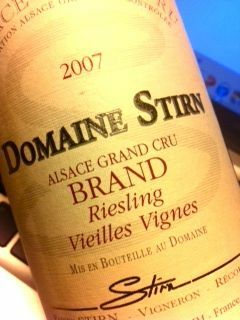 2007 Riesling Grand Cru Brand from Stirn in Sigolsheim has huge but focused aromas of chocolate, honey, lilac, clementines and arrack. The taste, however, is tight, perfectly balanced with rich and silky fruit that expand into a firm and elegant minerality. A perfect illustration of how the vines on Brans receive sun and heat through the canopy, while the roots seek nourishment and survival deep in a fragile granite. Price: € 12. When will Alsace Pinot Noir stand up against red Burgundy? Never, is a good answer because a good Echezeaux, Chambertin and Bonnes Mares is in a class by itself. Regardless of reference. But also since reds from Pfalz and Ahr quite often puts Alsace in place. Fortunately, there are exceptions, and several of them are to be found in the sector Rouffach, Westhalten and Soultzmatt. A little warmer, a little more iron, a little harsher but mostly - abundance of determination, passion and skill. 2008 Pinot Noir from Agathe Bursin in Westhalten has carmine red color. The nose is well defined with currants, black cherries, cooked carrots and wonderfully integrated vanilla. The taste is initially acidic, but opens up in the glass and presents its' silky fruit, supple acidity and a tight finish with no trace of stalkiness. Price: € 14.